Serge Poliakoff was a Russian artist associated with the School of Paris and the abstract movements of postwar Europe. Employing patches of bold color within non-representational composition, Poliakoff’s paintings are characterized by their interlocking jigsaw arrangements. Our Fine Art Gallery has the finest quality Serge Poliakoff original prints, aquatints, etchings, abstract, and signed artworks. We have a large inventory available off-site and we encourage you to make an appointment to see specific works you are looking to collect. We are happy to meet you at either our art gallery showroom or at your home or office for a private presentation. Serge Poliakoff was one of the most prolific and compelling post-war abstract artists. Serge Poliakoff abstract art typically consist of sporadic, contiguous, geometric shapes in salient color combinations. Poliakoff’s paintings are rife with compositions which are brightly colored and highly decorative. His work went on to influence a new generation of modern artists. Russian artist Serge Poliakoff, was born January 8th, 1906 in Moscow. He fled Russia in 1919 and travelled throughout Eastern Europe from 1919-1923, stopping in Constantinople, Sofia, Belgrade, Vienna, and Berlin. During this time Poliakoff supported himself through his talents as a guitarist. In 1923, Poliakoff finally settled in Paris. In 1930, Serge Poliakoff began his formal study of art at Académie de la Grande Chaumière. After his first stint in Paris, in 1935 Poliakoff moved to London to study at the Slade School. After studying in London for two years Serge moved back to Paris in 1937 where he met abstract artists Wassily Kandinsky, Sonia and Robert Delaunay, and Otto Freundlich. Kandinsky was impressed by the young artist and influenced Serge Poliakoff’s art greatly. Up until this point Poliakoff’s artworks were mostly academic but by 1938 he painted his first abstraction. Serge Poliakoff had his first abstract artwork shown at Le Niveau art gallery in 38′, the same year he showed at the Salon des Independant. In 1945, Poliakoff exhibited his abstract painting at the Esquisse gallery, as well as the Denise René gallery. Serge Poliakoff was awarded the Kandinsky prize in 1947. Serge Poliakoff prints, paintings, and gouaches were shown in different galleries throughout France and abroad in this time. In 1952, Poliakoff was given a contract with the Bing gallery, which allowed him to quit his night job as a guitar-player. Poliakoff had his first art exhibition in New York at Jean Larcade’s Circle & Square gallery. Poliakoff’s first discursive exhibition was in 1953 at the Brussels Palais de Beaux Arts, he displayed 45 paintings and 5 gouaches, and prints. Serge Poliakoff graphic art really hit its peak throughout the fifties and sixties; he created 130 original prints in this time. 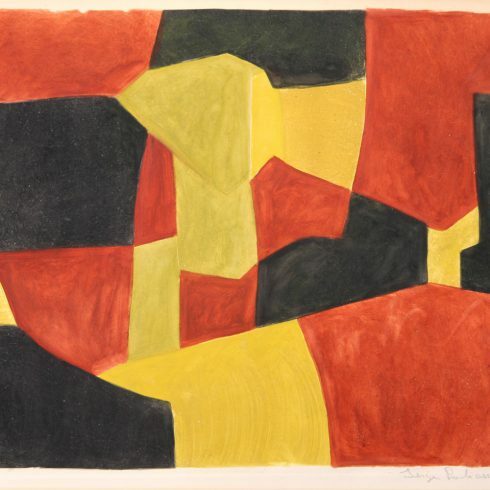 Serge Poliakoff lithographs in color were created after 53′ and he worked with etching and aquatint after 57′. In 1962, Poliakoff received French citizenship. In the same year the Venice Biennale featured a whole room of his art. Poliakoff died in Paris in 1969.